In a compact little room tucked away a floor below the main hall of the Library of Congress in Washington DC, there is a piano and a typewriter. The piano belonged to George Gershwin (1898-1937), the typewriter to his brother Ira (1896-1983), one of the most successful songwriting teams in history. Even though each man worked with other people over the course of their lives, their fraternal and creative partnership was one of mutual respect and the highest level of professionalism. Everyone knows a Gershwin song: Someone to watch over me, The man I love, I’ll build a stairway to paradise, Embraceable you, I got rhythm, But not for me, Love is here to stay – spot-on lyrics and unforgettable melodies. Many songs from musicals they wrote like Strike up the band, Funny Face and Let ’em eat cake have become jazz and popular standards. As well as a master of popular music, George Gershwin is also one of America’s finest composers of orchestral music, his Rhapsody in Blue as sensational today as it was when it was first performed in 1924, the piano played by George himself. Critics didn’t know how to react to the syncopated rhythms within the symphonic form. Eager to pigeonhole music into a particular genre, this spectacular piece defied categorisation. It wasn’t classical, it wasn’t jazz, it wasn’t popular, yet it was all three at once. Rhapsody in blue was a groundbreaking piece of music, an icon of American culture and one of the most popular concert pieces in the entire classical/jazz repertoire. The plangent opening bluesy glissando from the clarinet is one of the most recognisable musical openings of all time. His jazz-based improvisational approach coupled with his mastery of popular music and love of the classics resulted in another of George’s great works – the Concerto in F (1926). Commentator Peter Gutmann writes that with this remarkable piece, George Gershwin became “the first American to be able to approach classical music as part of a great continuum, and to regard pop not as cultural slumming but in a wholehearted embrace among equals”. Here’s a scene from the 1951 film An American in Paris, featuring the third movement of the Concerto in F, played by his friend, musician and actor Oscar Levant. If you don’t know what the musical term “allegro agitato” means, you sure will by the end of the clip. While in Paris, George was inspired to write An American in Paris (1928), a work of striking originality incorporating car horns and fascinating rhythms (haha, get it?). Again it was an expert melding of jazz, blues and classical elements, the result another extraordinarily innovative work. George and Ira were born in New York at the end of the nineteenth century. George took to the piano like a duck to water, and by age 15 was working as a professional pianist, soon scoring a job as a “song-plugger” in Tin Pan Alley, which entailed playing new sheet music for a publishing house. The more people who heard the song, the more copies were sold. All this hammering out tunes day-in-day-out helped George refine his playing and improvisational skills and sowed the seed for his own compositional forays. He had his first song published in 1916 and before long was involved in Broadway musicals. His song Swanee performed by Al Jolson brought him wider renown. Soon after, he wrote the score for the Broadway musical La, La Lucille. He was off and running. There’s no mistaking Ira’s lyrics. They’re inventive, fitting the melodies in sometimes unexpected ways, wonderful works of creativity and originality. Ira won a Pulitzer Prize for his lyrics (shared with George S Kaufman and Morrie Ryskind) for Of thee I sing, the first Pulitzer ever awarded for songwriting. George and Ira wrote scores for Hollywood musicals, among them Delicious (1931) and Shall we dance (1937) with Fred Astaire and Ginger Rogers, which received an Oscar nomination for Best Music/Original Song. They were on top of the world, but in early 1937 George began to experience excruciating headaches. A few months later, he was dead from a brain tumour. He was only 38. After George’s sudden tragic death Ira went into a decline for a few years. Theirs was such a symbiotic partnership that Ira felt unable to collaborate with other composers. Fortunately he returned to work around 1940, writing lyrics for Kurt Weill’s Lady in the dark. He later worked with composers Jerome Kern and Harry Warren among others. With Harold Arlen he wrote The man that got away, sung to perfection by Judy Garland in A star is born (1954), that film honoured with another Oscar nomination for Best Music/Original Song. As well as his own work – including compiling a collection of his work in the 1959 Lyrics on several occasions – Ira saw it as his responsibility to look after his brother’s estate and to safeguard the Gershwin legacy. Before his death in 1983 at the age of 86, he wrote copious notes and gave them, along with original manuscripts and other items relevant to the Gershwin brothers’ musical oeuvre, to the Library of Congress. If you’re in Washington DC, it’s really worth seeing that little room. 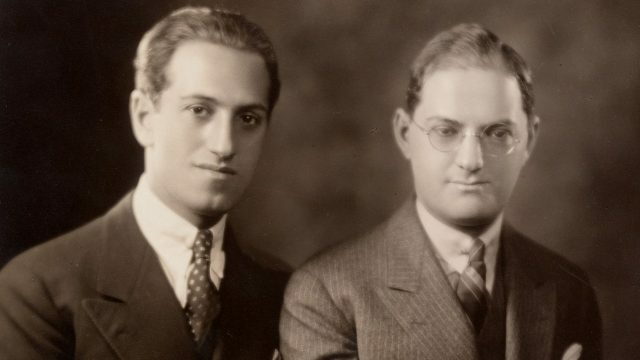 George and Ira Gershwin were siblings without rivalry. That… ’S wonderful!